The OIC is a ground reality, and to the extent that it affects the national interest, New Delhi ought to be interested. 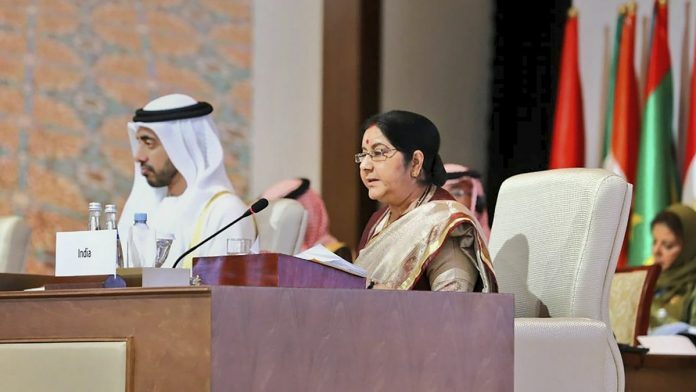 There is a delicious irony in the Indian external affairs minister being the guest of honour at the OIC foreign ministers’ conclave in Abu Dhabi last week. The hosts did not rescind their invitation to India despite Pakistan’s strident protest, and accepted a Pakistani ministerial boycott as a price worth paying for the benefit of engaging India. Ironic, because it is almost exactly the opposite of what happened in September 1969, when the leaders of Muslim countries had assembled in Rabat, Morocco to inaugurate the Organisation of the Islamic Conference (since renamed to the Organisation of Islamic Cooperation). India was unceremoniously denied membership of the OIC because Gen. Yahya Khan, Pakistan’s then president, threw a massive tantrum in Rabat, refusing to step out of his villa if the Indian delegation was not excluded from the proceedings. Fearing Yahya’s non-attendance would result in the historic summit ending in failure, the host — the King Hassan II of Morocco — buckled and “disinvited” the Indian delegation led by Fakhruddin Ali Ahmad, then a minister in Indira Gandhi’s cabinet. From that day, Pakistan has used its membership of the OIC not only to keep India out of the organisation, but to use it to promote anti-India positions among Muslim countries. In his oral history of the episode, Gurbachan Singh, then India’s ambassador to Morocco, detailed how events played out that September of 1969. In the months leading up to the summit, Pakistan “contrived to get itself included (in the preparatory committee) on the plea that it was the largest ‘Islamic’ state.” It then leaned on influential Muslim countries to make membership of the OIC open to only countries with either a Muslim majority, or with a Muslim head of state. India would have qualified even under these conditions had President Zakir Husain not passed away in May that year. Even so, King Faisal of Saudi Arabia and King Hassan of Morocco led the other heads of state to “unanimously” invite an Indian delegation to participate in the first summit. Remarkably, the preparatory committee recommended that a summit be convened within a mere two weeks. Things seem to have thus been put together at the last minute. While awaiting the official delegation led by Fakhruddin Ali Ahmad, Singh was asked to represent India. Yahya was present but didn’t object even at this point. Singh believes that Yahya developed cold feet that evening, after he was told that public opinion in Pakistan and many politicians, especially Zulfikar Ali Bhutto, would chew him up if he allowed the Indian delegation to participate in the summit. Major communal riots had just taken place in Ahmedabad, where hundreds of people — mostly Muslims — had been killed. This became a convenient pretext to exclude India. There was drama the next day. Yahya refused to turn up for the summit if the Indians were present, holding firm in the face of attempts by Kings Faisal and Hassan to find a way out. A delegation led by Tunku Abdul Rahman of Malaysia was dispatched to get the Indians to withdraw voluntarily. When Fakhruddin stood firm, the organisers went along with Pakistan and did not allow the Indian delegation into the summit venue. Back in India, the opposition parties led by the Swatantra Party and the Jana Sangh, supported by the newly split Congress (O), moved an adjournment motion in the Lok Sabha to censure the Indira Gandhi government over the humiliating fiasco. In the event, her government managed to win the vote with the support of the Left, the Akalis, the DMK and others. New Delhi took some diplomatic steps against Morocco, Jordan and others to register its protest against the manner the Indian delegation was treated. For all that, the decision of the OIC leaders was a clear indication of the relative importance they gave to India in 1969. The OIC’s decision in 2019 to honour the Indian foreign minister shows that the organisation has finally decided to accept new realities. To their credit, the ruling sheikhs of the UAE did not yield to Pakistani pressure. But even in the Pakistani foreign minister’s absence, the OIC’s statements didn’t change much, and there were the usual references to Kashmir. These references, though, are of as much consequence as the ones in the past, which is to say, very little. Inviting the Indian foreign minister as the guest of honour while condemning India over Kashmir would merely be one more contradiction in what could as well be called the Organisation of Internal Contradictions. The OIC claims to represent the ummah, the trans-national community of believers, is still constituted by nation-states. It claims to uphold human rights, but its most influential members deny them to their people. It claims to support the struggle of Muslim peoples, but also wants to avoid being accused of interference in the affairs of non-Islamic states whose support it needs. Indeed, through most of its history, the OIC merely looked like a useful front for Muslim countries to show rhetorical support for the Palestinian cause, while they were not too serious about it in practice. Now that the OIC might be slowly warming up to India, should New Delhi seek to become a member of such an organisation? No. For membership would imply endorsing its denominational charter. But there is a good case for India to be an observer. The argument that as a secular state India should keep away from the OIC misses the point. Even if it is a mere talk shop, the OIC is a ground reality, and to the extent that it affects the national interest, New Delhi ought to be interested. The UK, Canada and Russia are OIC observers for similar reasons. Pakistan, of course, will go all out to prevent India from getting a foothold in the OIC. If India continues on a path of rapid economic development while remaining committed to pluralism, the other members of the OIC will sooner or later decide that Islamabad’s objections can be overlooked. Isn’t realpolitik wonderful? The author is director of the Takshashila Institution. At a purely conceptual level, India’s membership of the OIC is deeply problematic. We already have good bilateral relationships with several of its members. Those should be further strengthened. While their affection for Pakistan is obviously more profound, both KSA and UAE have helped in defusing the recent crisis. India’s 180 million Muslims mean a lot to the members of the OIC in a way that does not undermines their loyalty to India. When Indian Muslims do well economically, are emotionally and physically secure and safe, that is something which raises us enormously in the esteem of the Islamic world. Sadly, the converse is also true.